Bond Economics: Primer: What Is A Taylor Rule? Primer: What Is A Taylor Rule? Since that first publication, this has been a major area of research for academics, central bankers, and market economists. As a result, there is now a wide variety of policy rules that are now generically described as “Taylor Rules.” I prefer to use a wide definition of a Taylor Rule. Using control systems engineering terminology, a Taylor Rule is a feedback rule for the interest rate which is proportional to state variables (which are not necessarily directly measured), or the “P” component of a “PID controller” (Proportional-Integral-Derivative). The standard class of Taylor Rules (which includes the [Taylor 1993] rule), is given by the decomposition below. The nominal policy rate is the sum of the following terms. The “natural” real rate of interest. This could be a fixed constant ([Taylor 1993] used 2%), or it could vary over time. Short-term inflation expectations. This could either be an actual inflation expectations series (either from a survey or based on what is priced into inflation-linked bond markets), or historical inflation rates. (The [Taylor 1993] rule used a measure of historical inflation, the annual rate of change of the GDP deflator.) The use of historical inflation is justified on the theory that people’s estimates of inflation are going to be close to observed inflation over the short run. Economists within the English-speaking world would now generally use “core” inflation (the inflation rate excluding the effect of energy and food prices), as the effect of energy price movements are seen as transitory. Inflation-phobic continental European economists will tend to use the higher value of the all-item inflation (“headline inflation”) or core inflation. This is why the European Central Bank hiked rates in 2008 in response to an oil price spike, just ahead of the greatest financial crisis since the 1930s. Finally, it is important that this is short-term inflation expectations, not long term. Because inflation-targeting central banks objective is to keep long-term inflation expectations stable (which has roughly been the case since 1994 in places like the United States and Canada), using long-term inflation expectations would result in this term being roughly constant. Output gap. The rule also needs to take into account the state of the economy, and not just inflation expectations. If the economy is depressed, interest rates need to be lowered, even if inflation expectations are near target (as has been the case for previous years). This is usually expressed as adding a constant times the output gap. [Taylor 1993] used a factor of ½ of the deviation of real GDP from trend, measured as a percentage of real GDP. Once again, different rules use different weighting constants. Additionally, researchers may use other variables that act similarly to the output gap, such as the unemployment gap. The chart below gives an updated version of the original [Taylor 1993] rule. There is a key difference, in that I have used the output gap as calculated by the Congressional Budget Office; [Taylor 1993] used a measure of GDP deviation from trend. The Taylor Rule policy rate follows similar patterns to the actual rate decisions of the Federal Reserve, but the gap between the rule output and the actual rate can be significant. where n(t) is the nominal interest rate, p(t) is the annual inflation of the GDP deflator, and O(t) is the (CBO) output gap (as a percentage of real GDP). The “natural real interest rate” is assumed to be a constant 2%, and the Fed is implicitly assumed to be targeting a 2% rate of inflation in the GDP deflator. One can attempt to get a better fit by choosing alternatives for these components. For example, the natural real interest rate could vary over time. Three broad strands of research are associated with Taylor rules. Determining a rule that best fits how a central bank reacts to data (widely known as the “reaction function”), and then using this rule to forecast the policy rate. This is extremely common in market research. Dynamic Stochastic General Equilibrium (DSGE) models use the assumption that economic outcomes are the result of optimising decisions of households. Since the optimisation is forward-looking (in the extreme, until time goes to infinity), households need to embed a reaction function for the central bank, as otherwise the future trajectory of interest rates is undefined. Therefore, every DSGE model has to have a reaction function, which are commonly some variant of a Taylor Rule (although more complicated dynamics are possible, such as “optimal control” rules). Since DSGE model work is mainly driven by the needs of central banks, the properties of reaction functions are heavily scrutinised. Is rules-based policy superior to “discretionary” policy? This was the focus of the [Taylor 1993] paper, and Professor Taylor has continued this argument since then. For example, he argues that the housing bubble of the 2000s was driven by too low policy rates; that is, the actual path of the fed funds rate was below what was predicted by a Taylor rule after 2003. An additional source of fodder for research is the complication created by the fact that it is difficult for interest rates to become negative. The standard specification of a Taylor rule is that it is a sum of components means that this is not easily taken into account. (The fact that people can withdraw cash from the banking system in order to lock in a 0% rate of interest creates the limitation on negative rates.) Since withdrawing cash in bulk is not really an option for institutional investors, slightly negative policy rates are feasible, but it is hard to see interest rates being pushed lower than -2%. This matters a lot for academic research that is trying to find the “best” Taylor rule for the central bank; but it is not that big a deal for financial market analysts that are just attempting to guess what the central bank is going to do. In principle, an accurate Taylor Rule would be an extremely valuable tool for a fixed income analyst. All you would need to do is to forecast the components, and you could then then come up with an accurate forecast for the path of the policy rate. This in turn would make rates investing into a proverbial money-printing machine. Unfortunately, any experience with market research tells you that any halfway-competent economist has a Taylor Rule that validates their view of policy rates – no matter what that view is. A Taylor Rule is an economic Rorschach Test, in which economists can project whatever their views are onto the final result. Almost every term within a standard Taylor Rule is “squishy,” and these terms are tied together by somewhat arbitrary parameters. Either the terms are not directly measured (like the natural rate of interest, or the output gap), or there is no obvious consensus on what measured variables to use (market inflation expectations, core versus headline inflation, etc.). The freedom to choose the weighting parameters (within limits) means that there is considerable ability to get the output of the rule near historical policy rates. The researcher can then data mine the possible inputs so that the deviation at the endpoint matches their (or their bosses’) preconceived view as to where the policy rate should be right now. 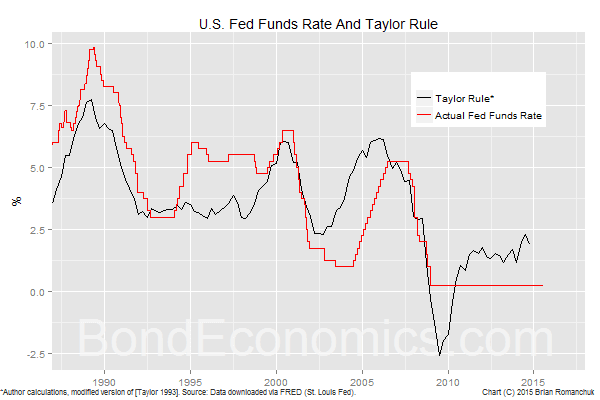 The Taylor Rule can then be “improved” when its fit deteriorates, or the desired output changes. In summary, the output of a Taylor Rule is only suggestive. Their value (if any) lies in the fact that they tells us what factors a central bank is probably looking at when setting rates. This may have been useful when central bank rate setting was shrouded in secrecy, but its usefulness is debatable when analysts are inundated with central bank research and policy maker jawboning. Note: This article is a first draft of content that appeared in the BondEconomics report Interest Rate Cycles. Not completely unrelated, but what do you think of nominal GDP targeting instead? I can't imagine that there is, but is there a modern money approach that controls inflation without resorting to wage and price controls? Whatever the economic advantages or disadvantages of wage and price controls, the one thing we can say about them is that in the current and foreseeable political climate they are highly unrealistic. Having disposed of the economically bad (Taylor rules) and the politically unrealistic (wage and price controls), are we not then left with the next best choice choice of nominal GDP targeting? Or is there an argument to be made that nominal GDP targeting in fact a better economic (ignoring the political dimension) approach than wage and price controls? I would not say that inflation targeting is "bad", although we need to keep in mind other objectives (mainly unemployment). The MMT argument is that we can have full employment with stable inflation using a Job Guarantee. This is therefore compatible with inflation targeting. As for the Taylor Rule, it is fairly reasonable (if you accept the standard assumptions about monetary policy), but we cannot view them as being scientific. Turning to nominal GDP targeting, I think it ends up being similar to inflation targeting. The big difference is that the proposed system attempts to catch up on below trend growth. You could do the same thing with the price level. The problem I see with NGDP targeting is that it will be very hard to communicate. It is easy to understand an inflation target and work it into your plans, but a nominal GDP target is meaningless at an individual level. As a result, I doubt that it would fly politically. "The MMT argument is that we can have full employment with stable inflation using a Job Guarantee." But would that in fact be sufficient? Had a JG been in force during the seventies, would that have controlled the inflationary energy shocks? Presumably not, leaving us to rely also on monetary policy. In this regard, I guess what I'm asking is the following. Is there any way of avoiding using the blunt instrument that is monetary policy, with or without a JG (although having a JG probably makes monetary policy less brutal)? Is it even theoretically possible to put aside monetary policy and solely use fiscal policy (although the delineation of monetary and fiscal policy is problematic), or is it by definition impossible, living in the world that we do? There are few choices and having a blunt instrument is better than having no instrument at all. I am in the camp that monetary policy is not particularly effective, but that is an out of consensus view. As a result, I think fiscal policy - and the state of the business cycle, which is not easily controlled - is the primary way inflation is controlled. That said, inflation is not too sensitive to the level of spending, so you cannot just look at deficits or whatever. the pattern of spending matters as well. it also depends on the wage bargaining, which is related to hard-to-control factors like the rate of unionization. I will take a look at what I have written, and I can try to explain my thinking in an article. I am in the middle of writing another one, so it might only appear in a few days. The inflation period of the 70's was not due to large fiscal deficits, but was the result of a 400% increase in the cost of oil with no substitution opportunities available combined with a high level of union membership that was able to index their wage increases to inflation which helped feed the upwards cycle. NGDP targeting is fine, thats basically what the Chinese do to hit their 7% GDP target every year, you just cant hit your NGDP target using monetary policy alone. Monetary policy changes the type of Govt liabilities outstanding (maturities outstanding, level of reserves compared to securities etc) but not the total number of Govt liabilities. Fiscal policy changes the total number of Govt liabilities outstanding. "The inflation period of the 70's was not due to large fiscal deficits, but was the result of a 400% increase in the cost of oil with no substitution opportunities available combined with a high level of union membership that was able to index their wage increases to inflation which helped feed the upwards cycle." I know that the conventional wisdom is that the energy shocks were the cause of the inflation, but I do wonder whether that argument accounts for much or all the inflation. The economic geographer David Harvey and others remind us that just prior to the energy shocks a massive housing boom collapsed and there was also a near-systemic banking collapse, all conveniently forgotten. How this would feed into inflation is another matter. Less productive capacity and lessons yet to be learned from Japan on how to deal with depression? In any case, the quadrupling of the oil price only brought them back into the range that they would have done had they not been set artificially low by US-backed dictatorships. Energy markets do not follow the usual supply and demand relations: oil is not really a commodity in the usual sense but a geopolitical bargaining chip used primarily against major economic competitors, for fifty years or so the EU and Japan and now China (see State Department and Pentagon declassified top secret documents which lay out the way energy is used to hinder rival economies). If energy were more like, say, the market for cotton, then the price of oil would near permanently be at the high end.